Lloyd's of London has reported a second consecutive year of losses after a series of natural disasters including hurricanes Florence and Michael and the deadly California wildfires. The insurance market reported a £1bn loss, halving its 2017 loss of £2.1bn. Chief executive John Neal vowed to turn around the market, saying this year would see an improved performance. The figures come a day after Lloyd's announced a plan to tackle an "entrenched" culture of sexism. Last year saw several large natural disasters including California wildfires, hurricanes Florence and Michael, and Typhoon Jebi in Japan. In total, Lloyd's said the disasters "led to major claims costing the Lloyd's market £2.9bn." 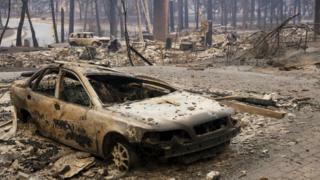 Research has suggested suggested increased temperatures due to global warming could mean more huge blazes in future. There could also be an increase in the intensity of hurricanes. Mr Neal said: "This performance is not of the standard that we would expect of a market that has both the heritage and quality of Lloyd's." But the group said annual results showed "green shoots of improvement", with insurance prices rising by 3.2%. Lloyd's said it aimed to cut the costs of doing business at Lloyd's and encourage new types of capital onto the Lloyd's platform. "We are super-confident that the plans presented for 2019 will put us back in profit," Mr Neal said. Lloyd's started life in Edward Lloyd's coffee house in 1688 and insures complex risks from ships to artwork. It houses around 80 member syndicates and its results are an aggregate of its members' financial performance. Insured losses from natural catastrophes such as typhoons in Japan and hurricanes and wildfires in the US totalled $80bn (£60bn) last year according to industry estimates. In 2017, losses were even larger, totalling $140bn after three large hurricanes in the US and the Caribbean. Competition in the sector has made it harder for insurers to raise their rates significantly. Lloyd's last year told its members to drop their worst-performing lines of business. The results came after Lloyd's pledged to bring in new measures after reports of a pervasive culture of sexual harassment at the insurance market. Last week, women told Bloomberg and the Independent they were "leered" and "letched" at and judged on their looks. Lloyd's, where hundreds of brokers and insurers meet to do business, was accused by Bloomberg Businessweek of being "the most archaic corner left in global finance". Explosions have been reported at two churches in Sri Lanka as Christians celebrate Easter.